It doesn’t matter what the season, Horseshoe Resort Riding Adventures — in association with SMART Programs — has a trail for you, your family or even for your corporate retreat. We are located one-hour north of Toronto and our trails offer an adventure of a lifetime! With endless kilometers of natural trails through the rugged Horseshoe Valley Forest, riders will encounter a wide range of challenging terrain on their guided tours; from hills and valleys to snow peaks, mud and gravel pits. Horseshoe Resort Riding Adventures by Yamaha allows you to experience these rides in a controlled and safe environment. Your tour package includes the use of a state-of-the-art Yamaha vehicle, a riding lesson, safety gear and fuel. Following the fitting of your safety equipment, you’ll be introduced to your instructor who’ll select just the right Yamaha machine for your level of riding experience. From there, you’ll receive full instruction on how to ride the vehicle, and then it’s off to the trails for an exciting adventure! 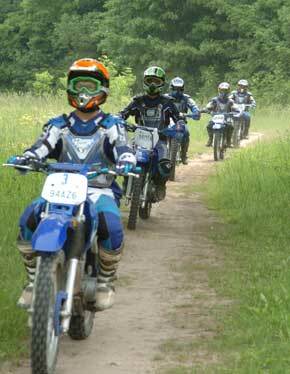 Experience the thrill and excitement of Off-Road Motorcycling under professional supervision. Yamaha’s rugged machines smooth out the toughest terrain—sand, gravel, mud and grass—and all levels of riders will have an exciting and challenging day on the trails. Travel the trails and paths and discover exhilarating passages, secret hideaways and spectacular forests. 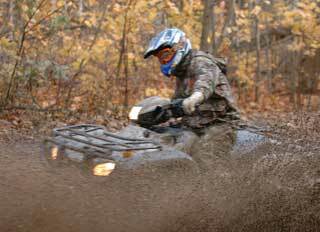 Yamaha’s multi-purpose ATVs offer both comfort and safety to the rider. Whatever you discover in the 200 acres of rock-hopping and hill-climbing, you’ll marvel at the magnificent scenery in Horseshoe Valley.